Celestia: this is remind me to re-watch my Gym time! Luna: oh? you mean re-wathc your diet? Celestia: No! Alicorn a Dont need diet but go to gym is very importent...! Oh by the Tree of Harmony! Celestia: i total forget to go to Gym and the Spa of last week thanks Discord and the Fue of the Noble i need to deal with it! Twilight: Why not we all go togeter next week? Luna: Hmm go to the Gym and to the Spa only as Princess time and no other pony? Cadance: Is a Graet idea and plus i will make foal sitting flurry heart by Your Parent! and Shining need to retraing all guards but this is a excuse for him to Traing Flash sentry! Celestia: Poor Flash sentry , he be Victime of the anger of Shining for date Twilight! Twilight: This i very not Prode of him for this...be overprotector is very annoying me! Cadance: well care of you and worry abort you! Luna: Plus he know he can't Protect Twilight all the time, plus he know if ruin your happyness of you and flash , and is the reason he want make captien of your own royal guards! Celestia: is Time you got your own royal staff menber, you can't cont only on your friends! Cadance: is normal to got some! plus i choise some for your future staff menber! Celestia: some of Our Royal maid dream to become your Royal maid Twilight! i know you like do thing by your self but is thing you can't do by your self! if i do all by my self, i will never finish a thing and i will never be have for teaching to other pony! Twilight: Graa, Ok Ok you won but still i prefer do my self! Celestia: i dont say everything need to be your maids or guards but yes is some of thing you can do by your self but other need to be by your guards or maids! Twilight: OK ok ok You won! Celestia: Dont worry , we will give you all the support you need and your friends will help too! 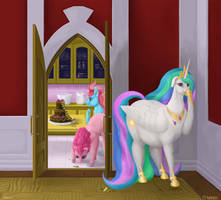 Cadance: Plus with guards and maids no pony will be lost in your castles like this poor Starlight! Luna: I think she be lost 6 time befor she finally fond her way! Celestia: Plus with Royal Staff menber will help you to get more time for your self! Raven: Princess here the Plan for the next month you a asking! Celestia: Thansk Raven but can you put in my Room? Celestia: see Twilight, with a help her i never feel lost in duty...i dont to think if be! Luna: I think you act like twilight a do last month! Discord: Yes you do and twilight what you a asking me! Twilight: Thanks Discord ,Oh and here take this cake ,you and fluttershy can eat on your tea party! Cadance: hihihihi Discord a be more Friendly if we compare of what he befor! Luna: yeah but now love tea Party with Fluttershy! Celestia: Discord be more usefor too but he get for you? Twilight: i lost book of magic who star swild a made! Celestia: A LOST BOOK OF MAGIC OF STAR SWILD!? Luna: IS THE ONE WE A LOOKING LIKE CRAZY TO FOND IT? Celestia&Luna: I WANT TO READ IT! Twilight: i will read but we can learn what is in it togeter? Luna: oh the fun will be double! Cadance: hehehehe to learn new spell! and the 4 alicorn princess past the rest of the day to learn new spells! Amazing work. And what made Cadence giggle? It's only inconvenient if you like skinny mares. What a tea party. I'm sure Flurry will be invited one day. Shouldn't it be a Quintarchy now; maybe have Flurry Heart in her stroller or a carrier seat? Looks awesome! I luv it!